Work Adjustment Lang Pandits should be only in One School : AP Language Pandits work adjustment should not be in Two Schools (3 Days in One School and 3 Days in another School) Rc.No.1882/Estt-I11/2017 Date: 01 /08/2018. AP School Education -Teachers working in Government, Zilla Parishad, Mandal Parishad - Work Adjustment of surplus subject Teachers -To ensure 100% subject teachers in High Schools/UP Schools - Certain Instructions -Issued - Reg. Language Pandits Work Adjustment Deputation should be in Only One School and should be as per Rc 1882 Dated 22.6.2018. 1) G.O.Ms.No: 29 School Education (SE.SER.II) Dept, dt: 22.05.2017. 2) G.O.Ms.No: 33, school Education (SER.II) Department, dated: 04.06.2017. 3) G.O.Ms.No.42 SE (Ser.Il) Department, Dated: 30.06.2017. 4) Discussions during Video conference held in June, 2018. 5) Proc.Rc.No.1882/Estt.111/2017 dt.21.06.2018 & 22.06.2018 of this office. 6. Lr.No.133-A/RUPPAP/2018, dt.02.07.2018 of RUPPAP. 7. Lr.dt.31.07.2018 of Hindi Teachers Union (HTU), AP. The attention of the Regional Joint Directors of School Education and the District Educational Officers in the State is invited to the references read above and it is noticed that, in some districts, the District Educational Officers issue work adjustment orders to Language Teachers to work in two schools i.e,3 days in one school and 3 days in another school. Therefore, all the District Educational Officers in the state are requested to follow work adjustment orders issued vide reference 5th cited and also instructed to submit a detailed report regarding work adjustment of Language pandits in two schools. 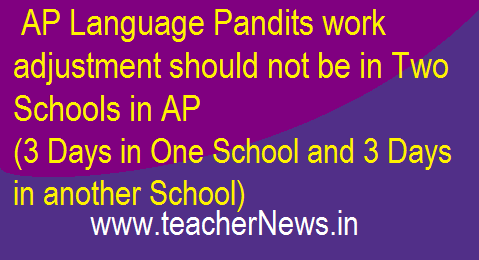 AP Language Pandits work adjustment should not be in Two Schools, Lang Pandits Work Adjustment should be only in One School.